As with any new army, you will go through growing pains for the first few games while you figure the army out and learn what it can and cannot do. There are also pains associated with learning a new edition of a game system, in this case, a new edition of WHFB. I am certainly going through both of these right now and I need to make sure I do not let the frustration get to me. It has been many a year since I last played WHFB, which was 5th Edition, and it is amazing how everything has come back to me so quickly. However I am finding that there is a lot I need to unlearn. So far, I have played three games of WHFB with my Ogres (all resulting in a loss) over the past two weeks and here are some of the things I have learned about Ogres and how they work in 8th edition, at least for me. Maneuverability - For some reason I have have some difficulty maneuvering my Ogre army. I am not sure if this has to do with the fact I am out of practice or that the large bases of the ogres make it more difficult. Maneuvering a horde unit (i.e. 50 Gnoblars) is tricky. Bulls - A good solid core unit. I have started running them in units of eight and including a Butcher in their ranks. This gives me a good solid three rank unit thanks to the Monsterous Infantry Ranking rule. S6 impact hits on the Charge, 2 ranks attacking with 18 Armor Piercing attacks, and Stomp attacks at the end of combat have really given this unit a fantastic boost. Crushers (champions) for +20 points for a single extra attack is overpriced IMO. I think Standards and Bellowers are required though. I was running them with Ironfists, but most of the time I find myself not using them, so I think I will stop giving them to the unit and moving the points elsewhere. Leadbelchers - An awesome unit. I have been running units of three models in a single rank, which could be contributing to my maneuvering problems. However, with the 8th Edition change that allows units to fire in two ranks, I am going to start running units of four models, 2 wide by 2 deep. This will increase the number of shots the unit can put out and make the unit easier to maneuver. Gnoblars - The Horde rule really helps this unit tremendously and if they are within 12" of the general, they turn into a quagmire unit that can bog down practically any unit out there. However, once the general is gone or out of range, chances are they will run on their first Ld roll. A horde of Gnoblars has the ability to put out a whopping 40 shots a turn or when being charged. Although they will generally only hit on 6s and wound on 5s, the sheer quantity of shots should not be underestimated (something I learned from playing Orks). Ogre Tyrant - I have been running my Tyrant with the Tenderizer (a greatweapon that causes D3 wounds per wound) and trying to use him as a character killer. I am beginning to think I should run him with two hand weapons instead, or with the new magic item from the rulebook that grants +2 attacks. This would give him 7 S5 attacks at I4. Not bad at all. Scraplauncher - Altough I yet to try this unit, I really think I need to. 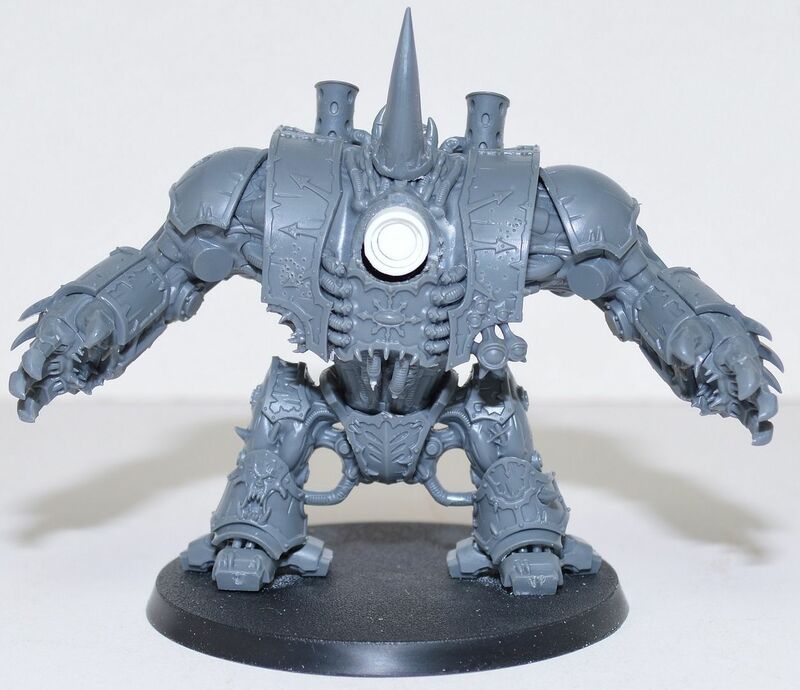 Warmachines, in general, got a great boost in 8th edition as most people already know, but it seems this one improved more. Scraplaunchers are a stonethrower and a chariot rolled into one. The first boost they get which apply to all stonethrowers is being able to premeasure distance and place the template without guessing. Second, as a chariot they are no longer auto destroyed by S7 wounds. I must start including one, maybe two. Let me know if you ever want to proxy some scrap launchers, and we can try them out in a game. Instead of playing them wide as a horde, think about playing the Gnoblars DEEP, and using the Steadfast rules to make them stubborn with your General's leadership. This is a much better tarpit. No matter how many points you lose by there is a good chance the Gnoblars will hold. I've switched to this tactic with my Skaven Slaves. Yes you lose out on attacks... but Gnoblars aren't there to kill stuff. You want them to redirect and to set up flank or rear charges. @k.Blas: I have not considered the Cathayan Longsword for the Tyrant, but I am thinking it is a good option for a BSB, which I am thinking I need to start including as well. @Rhellion: I already have one Scraplauncher, I just need to get it built. So the Steadfast rule is not a Horde specific rule? Somehow I was thinging it was. If that is not the case, I may need to try fielding them deep instead of wide. I'd love to get a game against your Skaven, unforunately the next couple of weeks will be busy for me. I am out of town this weekend, working the following weekend with moving servers, and the third weekend is my son's birthday party. Tuesday nights I will have to play by ear.